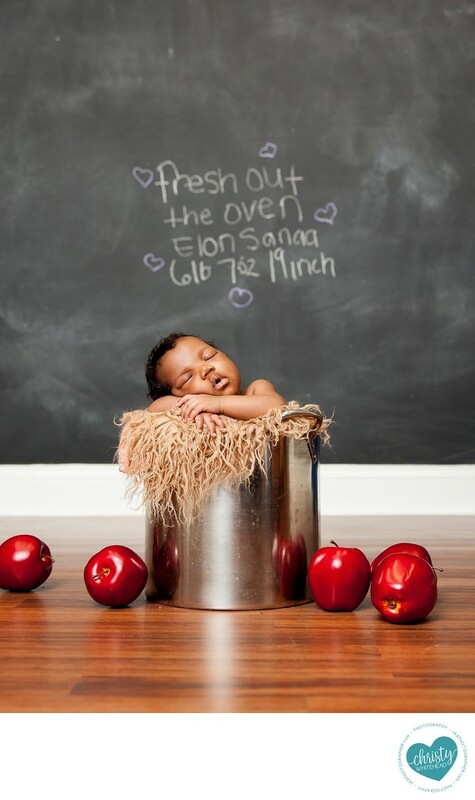 Fresh Out Of The Oven Baby With Apples In Pot - Newborn Photography | Schedule Your Newborn Shoot Today! When our babies are born, we basically begin to memorize them like our favorite book. I'm convinced the reason we have mom brain is because we're suddenly responsibly for memorizing an entire human being better than we know ourselves. But as well as we might know them, even you might not know these weirdly interesting fact about babies. Baby kneecaps don't show up in xrays because they're cartilage and will remain that way for the first few years. It's one of the reasons they can tuck them up so well for our favorite newborn poses. They have more bones than adults! This suprrises many people as they've always assumed babies have less. However at birth, they usually have 300 bones. As they grow the bones fuse and the number becomes 206. By his or her first birthday, their brain will be 60% of it's adult size. Have you ever watched your baby eat so ferociously you're convinced they are going to suffocate? Well it turns out, a baby can breathe and swallow at the same time until about 7 months of age. Mystery solved. Most newborns arrive during July, August, or September. Your baby can work out where a sound is coming from just 10 minutes after being born. This is why so many moms marvel at their newborns responding to their voices.